Congrats to the 2013 vExperts! I didn't make the cut for my first application to the VMware vExpert program, but congratulations to the nearly 600 people who did! Here's the official announcement (with a full list of vExperts). Looking forward to the "sorry you didn't make it" message to learn what I could do better for next time around. Can't say that I'm happy about not making the list, but I'm pleased with the following that I've built up over the past 5 months since starting this blog. By the looks of it, I've helped quite a few people with some VMTools installs on Fedora. That's what I'm most proud of. I'll save the grumbling and regret for my six pack of Natty Boh. In the meantime, if you made the list, it's time to celebrate! Congrats again! Quick post while I write a longer post for netcraftsmen.net. But the hosts were able to vmkping the other cluster members' management IP address, including the HA Master. (I admit that I checked DNS first; old habits die hard). It was late, I was two pots of coffee into a change window, and I was looking for help. So I posted a question to VMTN: vSphere HA Agent Unreachable. Well wouldn't you know it, Duncan Epping replied pretty quickly with some suggestions. He asked if I had changed SSL certificates recently, which I hadn't, and then included a link to some other steps to take. I ended up resolving the issue just by disabling HA on the cluster, then re-enabling it. Go figure. Fast forward to this morning, and what do I see from DuncanYB? A link to a new post he wrote about vSphere HA Agents in an unreachable state. It's great to know that the VMware community follows the sun, too. For Veteran LastPass Users - Update Your Password Iterations Value! I'm going to assume you're using LastPass to manage all of your passwords. For us VMware nerds, it's perfect for keeping track of the various vSphere Web Client logins we accumulate over time. You are using separate credentials for each site, right? I've been a user and fan of LastPass for years. So long in fact, that I've apparently been overlooking a few settings that LastPass has introduced lately. Specifically, I've neglected to update my Password Iterations value. You'll notice right away that the red text is floating the suggestion to you to raise the iterations used to create your master encryption key. If you're into light cryptology, click the More link to learn about how LastPass uses SHA-256 and PBKDF2. Otherwise, simply update the field above to 5000 and click the Increase Iterations button. You'll need to re-enter your password to start the key generation process. It will only take a few seconds for this process to complete. When it's done, you will need to login to LastPass again. This is because your encryption key has been re-created, so your current session is no longer valid. Just login again (your password hasn't changed as a result of this process), and you're done! It's important to keep in mind that, when you're an early adopter, it's easy to miss out on new features or capabilities that are introduced but are not retroactively applied to your account. Missing a single MDVMUG meeting? Ungood. Missing back-to-back MDVMUG meetings? Doubleplus ungood. Newspeak aside, I'll be missing another great evening in Catonsville. Though my excuse this time around is better than the last: I'll be doing some UCS work during an evening maintenance window. I'm just glad it's not the old NSF maintenance window from 00:00 to 08:00 Sunday. If you're in the area, and have some free time in the evening, I strongly encourage you to attend. I've cajoled a few coworkers to swing by and listen to the presentation from Nutanix. If you're not familiar with Nutanix, spend some time on their site and learn about their hardware solution for virtualization. Along with PernixData, I think Nutanix is in the front of the pack when it comes to storage virtualization. You'll also get an overview of the VMware Horizon suite, which can be refreshing for those of us who spend the bulk of our time in the data center space. The more I learn about Horizon, the more I like it. Still need more convincing? Nutanix is giving away an iPad. So there's that. Of course, I'll be attending the Potomac Regional VMware User Conference on June 13 in Washington, D.C. That's an amazing event put on by a ton of great sponsors, with heavy participation from VMware luminaries (last year, Cody Bunch and Alan Renouf were present to talk about automation and PowerCLI). Register here, and if you're going, I'll see you there. I love my Volvo S40. I've posted about my adventures with repairing the windshield washer fluid system, and I'm surprised how many people end up here to read that article. So here I am at 3am, writing more Volvo S40 linkbait for my fellow shabby arrogant bastards. Many people, myself included, have run into a problem with the glove box. The problem is that it won't open. You can lock and unlock it all you want, but the handle doesn't engage the locking bar under the dash. I've read a few posts that say you should drill a hole in the front of the door which will destroy the lock and open the box. But you'll still need to fix the lock at some point, and you'll have a hole in the door. Pop off the access panel on the passenger side of the dash (do this while the passenger door is open). 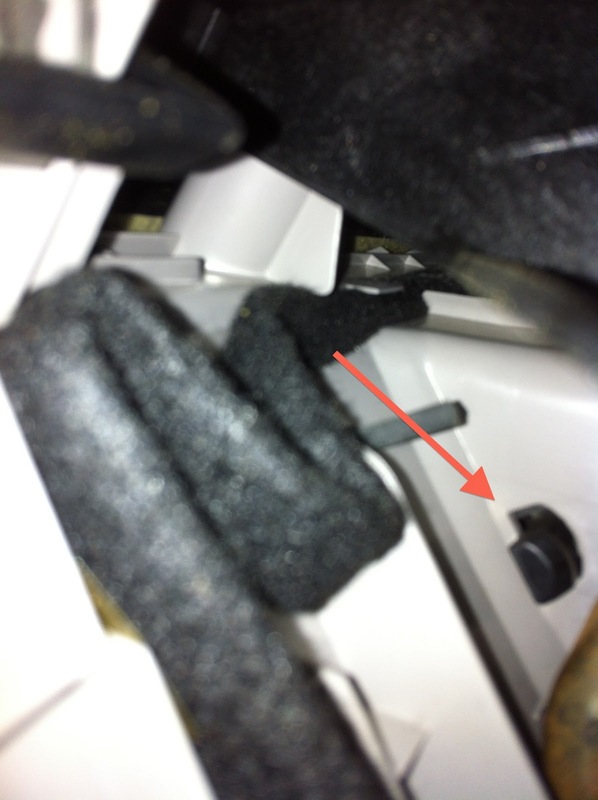 Remove the door vent deflector (a hard, black piece of plastic behind the access panel). Use a flashlight to locate the locking pin. It's about 4" into the access space. You should see a small black pin, round with a flat side. See image to the right. Use a long screwdriver to push that pin in until the glove box door opens. Next, I'll figure out how to repair the locking mechanism. Until then, this will at least let you get into the glove box. My advice is to keep your registration and insurance information elsewhere until that pesky lock is fixed. I heard it mentioned at the VMware Partner Exchange in Las Vegas this year. Two women speaking to each other, wondering aloud what the convention was about. One of the women remarked to the other, "I think it's just some software." I suppressed a chuckle. I bristled at the suggestion that VMware, and its vSphere software that I've devoted so many years of my life to learn and master, was "just some software." This stuff is IMPORTANT. It revolutionizes the modern data center, squeezes every last penny out of otherwise underutilized hardware, and come on: it's cool! But it's been creeping up on me since then: she was absolutely right. In the grand scheme of things, VMware, even virtualization as a whole, is just a tool to be considered for use in an enterprise IT operation. Don't use VMware? Guess what: it's still possible to run a successful enterprise IT shop, and therefore a successful business. Make no mistake: I love VMware. I love virtualization. I love all things Data Center. I'm good at it. But I'm finally getting some much-needed perspective, and it's just in time. Part of this realization is driven by a new project I'll be working on, where VMware is just one piece of a puzzle. There's storage, there's servers, there's network, there's email, there's applications, et cetera. So I'm pulling back a bit to recognize that importance of an enterprise where all facets, not just virtualization, are managed properly. It's refreshing. tl;dr - VMware is important. VMware is Not the World.